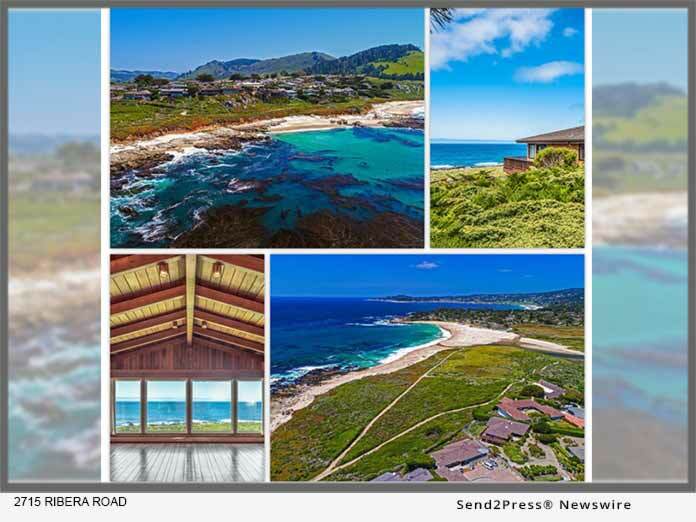 CARMEL, Calif., Dec 03, 2018 (SEND2PRESS NEWSWIRE) — Jonathan Spencer Properties has announced a rare opportunity to own an oceanfront slice of heaven in sought-after Carmel Meadows. To live in Carmel Meadows is to live in arguably one of the most gorgeous and glorious places imaginable. At over 4,200 square feet, this 5-bedroom and 3.5 bath property offers a beautiful canvas for the next owner to create a showpiece refuge in an exquisite setting that captures the senses and inspires the mind. This unique home and property offer unparalleled coastal views of Carmel Bay, Point Lobos, and Carmel River Beach. Retreat to the expansive wrap around deck to experience an oasis of natural serenity from morning to night with a picture-perfect sunrise to a breathtaking sunset. When you step into this home your field of vision will be suddenly filled with magnificent coastal views as it was strategically designed to capitalize on the wondrous backdrop via the use of large glass windows that cover the entire oceanside of this two-story home. The wood-paneled walls and vaulted ceiling in the living area enhances its spacious look with the focal point being the oversized windows that allow the majestic beauty to fill the room. For the outdoor lover this home is surrounded by fantastic trails that offer amazing hiking and spectacular panoramic vistas as well as easy shore access to deep water for divers to experience the exhilarating journey following the canyon down into its depths. 2715 Ribera Road is nestled in the popular small community of Carmel Meadows known for its idyllic setting and convenience to downtown Carmel capitalizing on the best of both worlds; remote privacy at home yet minutes away from the best of what Carmel-by-the-Sea and Pebble Beach has to offer. It is not a surprise that home availability in this ideal neighborhood is scarce making this home the perfect opportunity to seize. From the close proximity to top-notch dining, wonderful shopping, boutique wineries, and the world-renowned Pebble Beach Golf Links this superb home’s ultimate location is ideal in every way. Top Carmel and surrounding area producer, Jonathan Spencer, has not only been ranked Top 100 Realtor at Coldwell Banker but has also received Rookie of the Year honors and has closed over $66 million in high-end luxury sales. He is known for his unparalleled real estate marketing expertise, his attention to detail, and for his excellent professionalism providing top customer service. Jonathan is constantly on the forefront of implementing cutting edge strategies to get his client’s listings mass exposure. He continues to surpass the luxury real estate competition in Carmel and surrounding areas, year after year, all while maintaining a reputation for doing business with a prodigious work ethic.